The KONG Puppy Goodie Bone has been specifically designed to help puppies with chewing, as they transition from milk to adult teeth. KONG Puppy Goodie Bone is specially designed to help puppies with chewing, as they transition from milk to adult teeth. 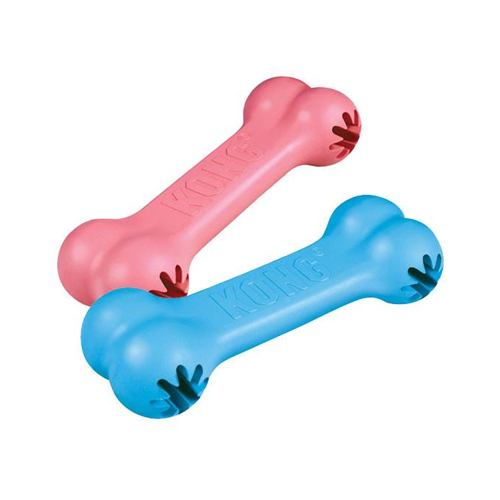 The Puppy KONG Goodie Bone is made of soft and flexible rubber that "massages" gums. This toy is made from the same rubber as the KONG Puppy. The Puppy KONG Goodie Bone XS has a rope that is perfect for cleaning and flossing the teeth of your puppy. Because size S has no rope, you can fill it with something tasty. The Puppy KONG Goodie Bone can be used until the age of 9 months. Have you used KONG Puppy Goodie Bone before? Let us know what you think about this product.